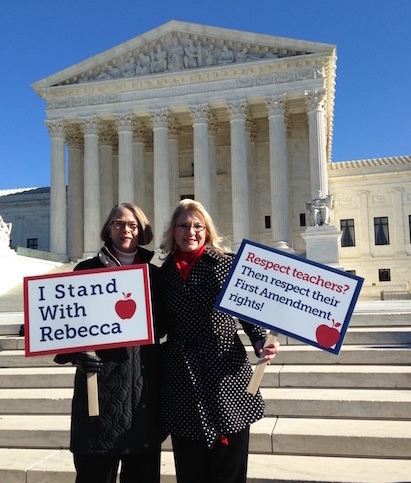 I spent the morning on the steps of our Supreme Court in Washington, D.C. standing with and for a teacher named Rebecca Friedrichs. Mrs. Friedrichs, a dedicated fourth grade teacher from California, is suing to end forced agency fees paid to the teachers’ unions (Friedrichs v. California Teachers Association). She believes they violate her First Amendment rights. Talk about a David versus Goliath contest! Rebecca Friedrichs’ team was up against the resources and power of organized labor, the federal government and the State of California. Nevertheless, early reports are encouraging. Mrs. Friedrichs had about 100 people at her rally, and I would guess about twice that number for the unions, maybe more. It was a smaller and more muted demonstration on the side of unions than I expected. The “fair share” or “agency fee”, endorsed by a unanimous Supreme Court in 1977 (Abood v. Detroit Board of Education) is a concession (or booby prize, depending on your point of view) to public employees who do not want to join a union. The idea is that the fee only covers the costs of “agency”—i.e., the costs of representing non-members in negotiating and enforcing collective bargaining agreements. The fee is not supposed to be spent on politicking. Mrs. Friedrichs wants Abood overruled, arguing that collective bargaining is inherently political, so that there is no way to separate the wheat (representation) from the chaff (politicking). Whether it is wages and benefits, education policy, pension reform, or the inequality debate, the unions are deep into politics and policy, playing a dominant role in Minnesota and across the nation. Collective bargaining, in the context of public employees, is political speech. While we may have to wait until June for a decision, the mood of court observers today, including Vernuccio, was one of excitement for Friedrichs. Over and over, lawyers I talked to on the Court steps said that it felt like a 5-4 decision for Friedrichs. Going in, there was concern about Justice Scalia (because of an earlier case), but observers report Scalia saying something to the effect that collective bargaining is inherently political, the winning theory of this case. That may be cause for optimism. Even Chief Justice Roberts is reported to have focused his guns on the unions and government, while Justice Kennedy was described by one long-time observer as “on fire” for the First Amendment. Going in, Friedrichs’s team was not concerned about Justice Thomas, or Justice Alito. Thomas is a solid supporter (and as is his style, silent today on the bench). Alito, who did not say much today, had essentially invited lawyers to bring this case in two recent decisions involving agency fees. He framed this issue. The left wing of the Court (Ginsburg, Breyer, Kagan and Sotomayor) would seem to be sure votes against Friedrichs, but who knows? Maybe one or two of them will get in touch with their inner rebel. Vernuccio also told me that when the justices asked for examples of collective bargaining issues that are not political, the opposition came up with just one. One lawyer suggested mileage reimbursements, but even that was shot down. This is why much has been written about the Friedrichs case (e.g., my op-ed in the Minneapolis Star Tribune today), and much more will be written, especially if the Court’s ruling restores full free speech rights to Mrs. Friedrichs. All hell will break lose on the left and in the mainstream media, but I think the average Joe and Suzy out there will get it. How can the government force a teacher, or any public employee, to support speech to which she objects? We will report when the Court’s decision comes down, but that likely won’t be until June. In the meantime, the Center of the American Experiment is leading the fight for employee freedom (both public and private) in Minnesota, and any contribution you might want to make will be welcome. UPDATE: The Los Angeles Times thinks Rebecca Friedrichs is going to win. Of course, the Times isn’t happy about the prospect of freedom for public employees. The court’s five Republican appointees strongly suggested they believe it is unconstitutional to force an objecting teacher from Orange County and millions like her to pay for union activities they do not support. Justice Anthony M. Kennedy described the mandatory fees as “coerced speech” that violates the 1st Amendment. Well, yeah. That is what they are. This is one of those left-wing positions that can’t survive the light of day.